Now's Your Chance! Get Two Dog Greeting Cards for the Price of One! Let your dog-loving friends know you're thinking about them. From our collection of Cecil Aldin's real and charming canines.... Or select some dressed and imaginative dogs! Good Dog Carl Fans Two Carl cards for the price of one! 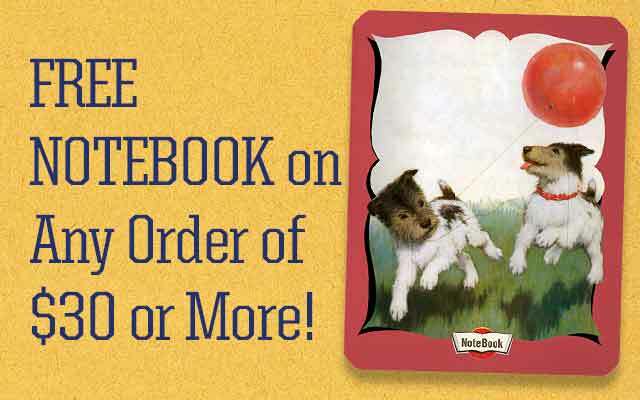 Order Any Dog Greeting Card And you'll automatically get a second copy of that card for FREE! Simpy place a card (or two, or four...) in your shopping cart and check out. We'll automatically double the cards you receive... Nothing further to do, and no promotion code required! Featuring well dressed cats, fully engaged in feline frolics... They're sure to bring a smile to the Cat lover in your life. 36 Vintage Postcards of Dressed Cats! All by Swiss artist Eugen Hartung. These hilarious cats mirror our human activities, and are both satirical and endearing. Made here in Seattle with high quality paper and packaged in a deluxe, keepsake box. "Spring has returned. The earth is like a child who knows poems." Are You Ready For Easter On April 21? Easter Greeting Cards The Easter egg is said to symbolize and represent joy, celebration and new life... Many of our Easter Cards feature Easter Eggs & Bunnies! Easter Rabbit Stickers Featuring Easter bunnies collecting and delivering eggs, dancing, and playing musical instruments. Butterfly Box Features some of the most colorful and traditionally beautiful stickers we've ever made. This cohesive collection of stickers focuses on the beauty of our Victorian-era butterfly images. 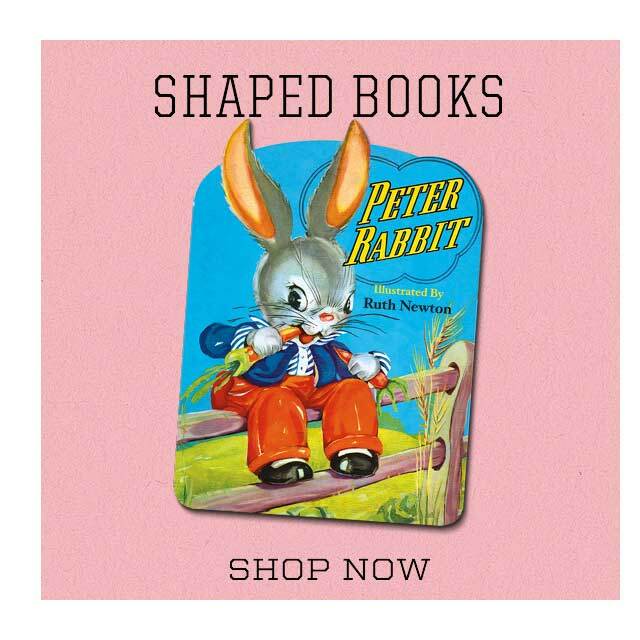 Easter Rabbit Postcard Book Contains 30 different Easter Postcards featuring vintage images to help you bring unexpected happiness into the lives of those close to you, or maybe those far away. Brand New Greeting Cards Say Hello to Spring! We have been cultivating the Laughing Elephant line of greeting cards for over 25 years (where does the time go!) Each year we review the list and see where we can improve by adding new cards to an occasion, to fill a gap, expand a popular design or simply refresh the line. You can be assured when you purchase Laughing Elephant Greeting Cards that they are created thoughtfully in the USA, Seattle to be specific, and are of the highest quality. Delicious Cakes in Entertaining Shapes! Coconut Covered Bunnies, Sailboats, Rocket Ships and Pink Elephants! Tells you how to make these, and many more entertaining cakes that will enliven any party. This kind of cake-making is a great project to do with children. Check Out Our Brand-New Title here! Spin the wheel and find out the drink for your sign with the handy book that not only provides expert advice on mixing drinks, but also information and conversation starters on the astrological signs. Apples to Zeppelin A Rockin' ABC for Cool Kids! This board book for Rockin' Kids sold out so fast we didn't get it reprinted before it was gone! And ready To ship to you now. We Can Express Gratitude In Many Ways! But a handwritten card is a simple and effective way to let someone know you recognize their gift to you, whether it be a present or a kindness. But Now It's Back In Stock! Everyone agrees it makes for a wonderful book & a great gift. Each Set comes with three pocket memo notebooks in a wallet sleeve. Two were inspired by Vintage Composition Books, and two by French Deco patterns. We took these wonderful old designs and made them into pocket sized notebooks to carry as easily as a cell phone. We're proud to announce a NEW Deluxe Greeting Card set. 12 Good Dog Carl Greeting Cards, themed for all the seasons of the year. Carl with his child friends in the spring, summer, fall and winter. All to send to dog-loving friends any time of year. Each set includes 2 each of 6 designs with 12 envelopes packaged in a deluxe, keepsake box. Originally published (and still available), The Three Bears, The Three Little Kittens and The Three Pigs, have been re-imagined and re-written as small early readers...Still with their charming shapes. Get yours today at just $9.95 retail! 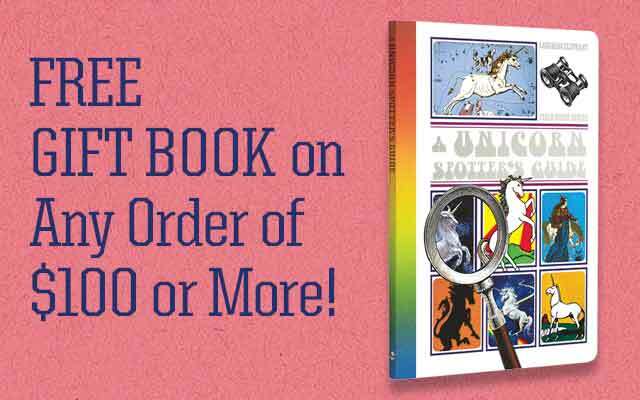 A Unicorn Spotter's Guide is a fun, richly illustrated book on how to meet and befriend an actual unicorn! Just in time for unicorn spotting season. We love Luggage Labels... And So Do You! 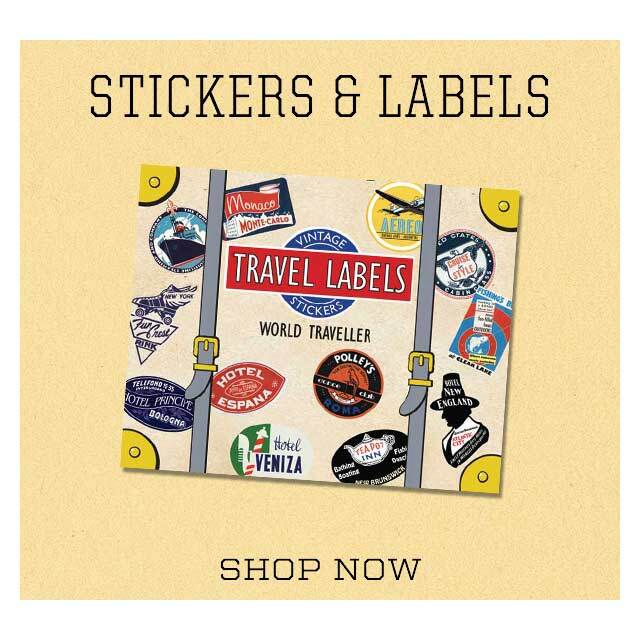 We first started reproducing vintage travel stickers over 25 years ago! Beautifully designed and wonderfully evocative of the era they were made, Luggage Labels have been part of our product offerings every year since. We now offer 14 different styles spanning the globe, each a little mini graphic portfolio of the region or idea it encompasses. Order a few boxes today, and travel in Vintage Style! Still Interested in a Little More History? Our Travel themed Blank Greeting Cards make great Bon Voyage cards and make a great correspondence card as well. 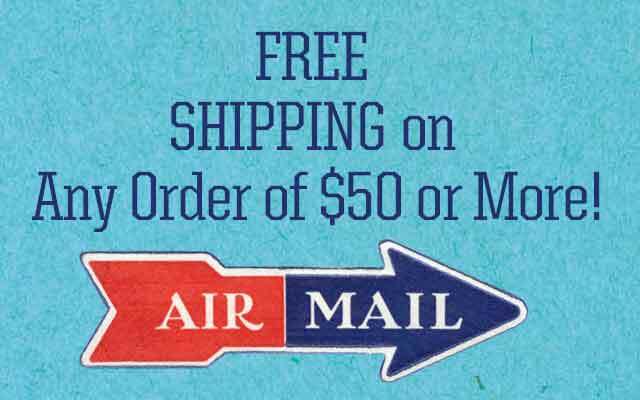 With intriguing themes like Americana, European Glamour, and unique concepts such as our Aerogram Mailers, there is something for everyone to celebrate the world and the world travel with friends and family. As Everyone Knows... Unicorns Are Love-ly! Who Doesn't Love Unicorns & Rainbows? We Sure Do! Our new box of 2 each of 4 charming Unicorn Greeting Cards, and 2 each of 4 beautiful rainbow Greeting Cards makes a Lovely Gift that's a little out of the ordinary. Stick a Unicorn here, stick one there, have a Unicorn anywhere you like! Twenty-Nine Beautiful Butterflies For Under Ten Dollars! Our Butterfly Box set of twenty-nine beautiful die-cut butterflies, selected from our archive of Victorian paper, beautifully answers the call. The Butterfly Box celebrates these beautiful, delicate creatures of the animal kingdom, their spectacular colors and their amazing variety. Perfect for scrapbooking, nature lovers, students, gift wrapping, or anyone that just appreciates a bit of beauty! Vintage Stickers Over 30 Styles to Choose From! With so many styles & possible uses, you're sure to find a set for yourself, or anyone in your life! Stickers are one of our most popular products.... And these sticker boxes are fun for kids of all ages, and can provide a touch of Vintage Style anywhere they are displayed. They're great for Scrapbooking, Gift-Wrap, Crafters... Or just adding that special touch to everyday items. Dressed Animal's are a favorite here at Laughing Elephant, so much so that we made a book all about them! In The Field-Guide to Well-Dressed Animals we have arranged them alphabetically from "A" Dressed Alligators, to "Z" Dressed Zebras, and all the Dressed Birds, Bears, Giraffes, Squirrels, Tigers, Yaks, etcetera, etcetera, in between. This book is a must have for anyone who loves cute animals in hats and feather boas. We also have a companion set in the Well Dressed Animals - Sticker Box for decorating and adorning your life and possessions with all your fashionable animal friends. Dressed Animal Greeting Cards will delight your friends and family on a wide variety of occasions with their frolicsome fun. 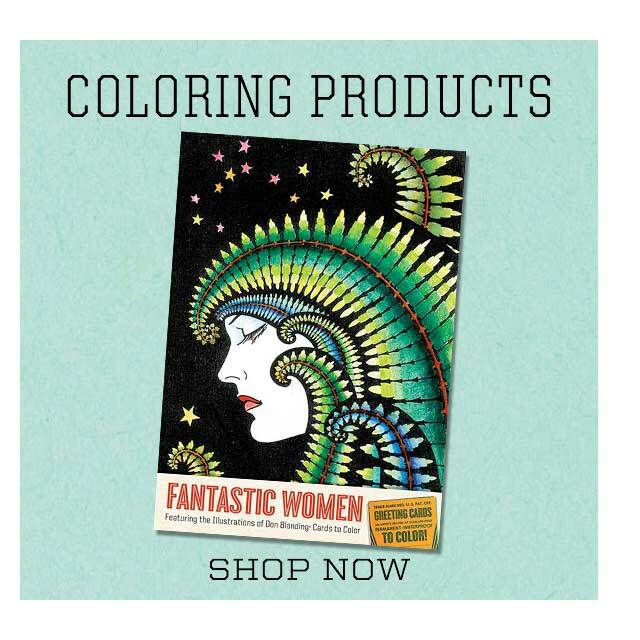 Plus Children's Books, and a Notebook or two that are sure to delight! We're sure you'll will want to share these messages of hope, encouragement, and thanks with many of your friends and family. We started with a small line of greeting cards, way back in 1992, they were an immediate hit... We haven't looked back! Here they are arranged into categories, some obvious, like Birthday, New Child and Sympathy and some not so obvious like Fairies, Flowers and Storybook Classics. Every Season Is Birthday Season! And with over 250 greeting cards to choose from Laughing Elephant has a cool, fun, fresh birthday card for everyone on your list. From Mom, to Junior to Aunt Maisie, Laughing Elephant greeting cards come in all varieties and moods, but all are sincere, beautifully illustrated and of the highest quality. Our NEW Book Title A Field-Guide to Well-Dressed Animals Explores the Dressed Animal Kingdom in a New Book! From Alligators in suits through to Zebras in blazers, and all the dapper dogs and cool looking cats in between, A Field-Guide to Well-Dressed Animals is the first in Laughing Elephant's whimiscal and attractive Field Guide series of books of serious looks at imaginative subjects. Also available are the Well-Dressed Animals Deluxe Sticker Box!... 124 individual Vintage Die-Cut Stickers in a keepsake box, featuring all manner of animals dressed beautifully! Fantastically, and stylishly, well-dressed, coiffed and be-hatted animals sure to provide lots of fun to use. Get Your Kicks with 30 Fabulous Stickers Celebrating America’s Legendary Route 66! Did you know that Alexandra Day, author of the classic Good Dog Carl series of beloved children's books, is the pen name of our own Sandra Darling? Get Exclusive Signed Carl Art Prints, Books & Greeting Cards Here! Capture Your Creativity in Style! At 20 pages, Our Slim & Elegant Notebooks are the Perfect Companion to Your Creative Projects! Capture Your Flights of Imagination, Memoirs, Lists and Loves in Our Hello Darling Notebooks... Illustrated With Classic Children's Book Art. These beautiful cards were created in the 1920s and '30s when ladies' bridge parties were all the rage. We just adored them!... And knew they were the perfect inspiration for a new line of unique Greeting Cards. We have reproduced them as they were originally: die-cut and embellished with gold foil. We provide a dark card with a deco pattern which makes an ideal background to frame or otherwise display the image, and a decorative envelope so that one of these lovely cards can be shared with a friend!